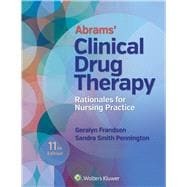 Written by expert pharmacology educators and clinicians, Abrams’ Clinical Drug Therapy has a long tradition of guiding students and instructors through the practice of safe and effective medication administration. Highly praised for its organized and readable presentation, the text explains the "why" behind each nursing action, and emphasizes individualized nursing care and drug therapy. Filled with vibrant illustrations, including new concept maps, the text provides a solid foundation for understanding clinical drug therapy, evidence-based standards for administration, and how to prevent or minimize adverse effects. Complemented with exciting free online resources, the textbook employs innovative features that guide students through the course, while also preparing for success on the NCLEX® Examination and in nursing practice. Also included is a free copy of Lippincott's Photo Atlas of Medication Administration, which uses the nursing process format to provide step-by-step nursing skills (with rationales). In addition to being completely illustrated, the Photo Atlas also contains documentation guidelines and samples, and Unexpected Situations, which explain how to respond to unanticipated outcomes. Topics include removing medication from an ampule, removing medication from a vial, mixing medications from two vials in one syringe, administering an intradermal injection, and more. NEW! SBAR added to the Clinical Application Feature. Black Box Warnings highlight serious life-threatening adverse effects identified by the FDA.